When you're rushing hurriedly after work, hoping that you’ve manage to reach the shops before they close, you don't really expect anyone to talk to you let alone come up with such an awkward question. In fairness it was one that I’d asked myself in the past. 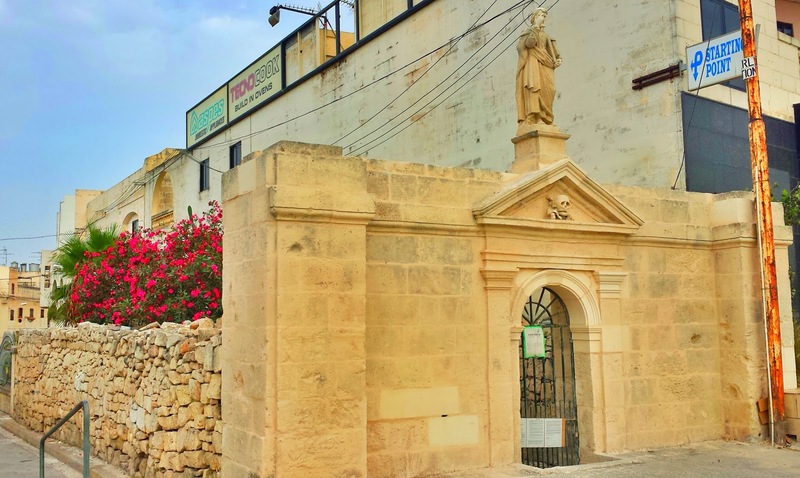 Clearly left outside while his wife did the shopping, my interlocutor was standing by his car in a street – the one in Luqa leading to the roundabout with the infamous statue – where one doesn’t go to do much else except shop. The object of his curiosity, however, definitely wasn’t a shop. He was looking at a small structure, sandwiched between a cafeteria that probably doesn’t attract anyone except workmen and a huge warehouse selling car accessories, which leaves you with little doubt that it comes from a different era to its surroundings. The instinctive reaction is that it must have formed part of an old farmhouse that, somehow, managed to avoid falling in some developer’s and being torn down to make way for another monstrosity like the rest of the buildings around it. Closer inspection, however, corrects that impression; this is something more than a simple farmhouse. Whilst the side wall might be built out of rubble, the façade is much more intricate. The big giveaway is, I guess, a skull carved out of stone that stands above the main entrance but it was only later than I made the vital connection. At the time, however, it didn’t mean too much and only served to make this place all the more mysterious. A look inside – for there is no real door but a large iron gate – revealed a few trees and bushes but nothing to help answer the question. “What is this place?” I couldn’t answer the question neither for the inquiring man nor, more importantly, for myself. Nevertheless, curiosity had been sufficiently heightened so much that the following day a call was made to the Luqa Local Council and finally I had an (rather obvious, in hindsight) answer of this mysterious place’s origin: a cemetery. Or, at least, it had been one of sorts. More research revealed that in this place there had once stood a chapel dedicated to Saint Thomas. In time this was abandoned so much that in 1771 the order was given to demolish it completely. Nothing much changed over the next century until two people – Dun Pietru Demicoli and Indri Spiteri – took an interest in the former chapel’s location and found a number of human bones when clearing the area up,. Upon this discovery, they decided to refashion the place into a cemetery with a large urn being placed in the middle and all the remains found placed in it. The urn is still there (it can be seen from the outside) but it is impossible to tell whether it still holds any bones inside it. In time, a statue portraying Saint Thomas was placed on top of the facade. Until recently this had been headless but, thankfully, restoration work has fixed this. Sadly, two further statues that had been placed on either side of the main one but these were destroyed towards the end of the last century. No one seems to know what happened to them. A small mystery, therefore, to replace the one that had finally been solved. Want to take a look at the Saint Thomas Cemetery? Here are the directions.